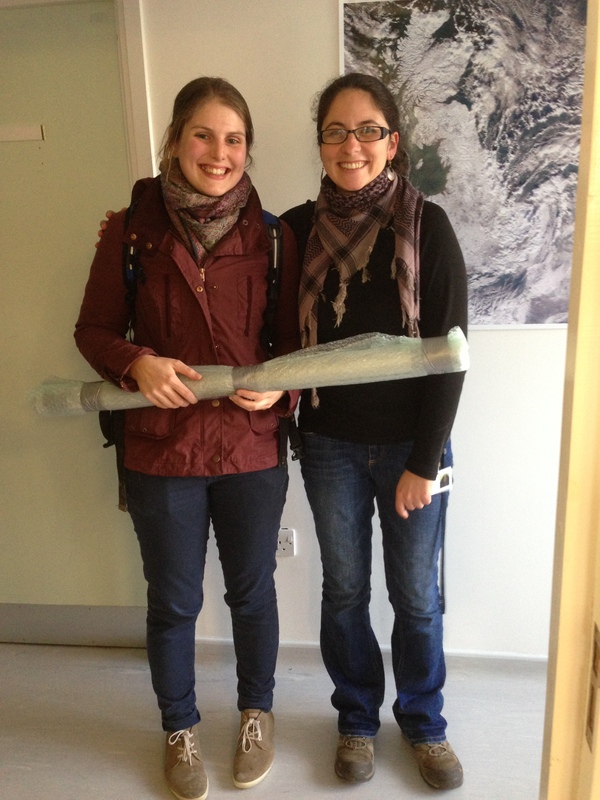 Rachel Gill and Encarni Montoya with sediment cores from Jamaica. Early in the month we were delighted to welcome Prof. Jonathan Holmes and Rachel Gill from UCL who came to use our core splitter to open new sediment cores from Wally Wash Pond in Jamaica! A visit from Steve Brooks (Natural History Museum) early in the month to discuss midgy progress with Frazer was great. We are getting ever closer to developing a training data set… Also popping by was ex-PhD student and now Aberystwyth lecturer Joe Williams who we will hopefully be developing some new collaborations with over the summer and fingers crossed mounting an expedition back to Bolivia! Provided comment on the student project proposal for the Level 3 Science Project Course: Geosciences (SXG390). Some really excellent and interesting projects focusing on a whole range of past environmental change issues from the spatial extent of the Younger Dryas cold period, through issues regarding environmenal changes triggered by alteration in ocean circulation, to the significance of carbon isotope excursions during the Palaeocene-Eocene thermal maximum. Monitoring the web forum whilst the Level 2 Practical Science: Earth and Environmental Science (SXG288) Discovering Cyprus: Rocks, mud and water investigation was underway. Interesting feedback from students regarding use of virtual microscope and great engagement and effort from all. Recruitment of 5 new PhD students to the department to start on a range of projects in October 2013 has been completed. Two more posts are being advertised accross the department. Date has been set for the CEPSAR student mini-conference. All the Environment, Earth and Ecosystem 2nd and 3rd year PhD students will be presenting on Thursday 16 May. Should be exciting! Advertising a PhD and PDRA post for our new NERC grant. Amazing amount of organisation in trying to recruite people! Excited to have two paper accepted at the Royal Geographical Society with IBG Annual Conference in the Human-environment interactions in the Neotropics: Historical impact to current challeges session.